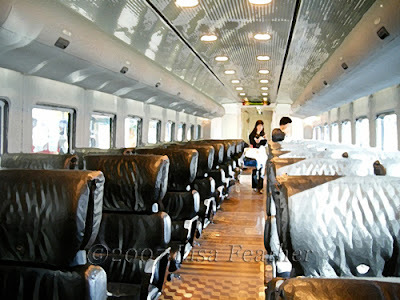 On the way from Nagasaki to Fukuoka we happened to board the most splendid train car I have ever had the pleasure to be a passenger on. It had parquet wood floors and black leather seats. It was clean, comfortable, spacious and uncrowded. As we waited for the train to leave the station several other passengers boarded and there was time to take a few photos of our environment. I liked this image in particular. It seemed to capture the dreamlike quality of this unique travel experience.